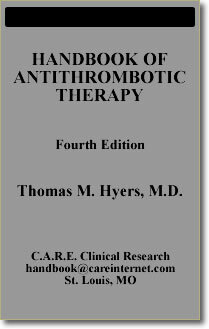 The fourth edition of this handbook is designed to give the practitioner convenient access to practical information on established and emerging antithrombotic agents. Proper use of these agents can substantially reduce mortality and morbidity in patients with thrombotic diseases. Whenever possible, algorithms are used to aid in dosing and monitoring antithrombotic agents. Some of these algorithms have been validated in prospective studies (pages 8 and 9) whereas others (pages 30-37) are derived from widespread experience. The reader should keep in mind that these algorithms are recommendations and not rigid practice guidelines. The reader will also find flow charts to help in the diagnostic approach to important thrombotic diseases including pulmonary embolism (PE), deep venous thrombosis (DVT), atrial fibrillation (AF), and myocardial infarction (MI). Bleeding in Patients Receiving Heparin. Rapid Evaluation of Patients with Acute Myocardial Infarction. Handbooks are $2.50 each and sold in lots of 10 or more. Ordering instructions are available here.